Course On Drawing And Painting For Children is an event that took place between 24-Dec-2005 and 26-Mar-2006 in Hyderabad. You can make your child a philosopher, a mathamatician, or a scientist - just teach him to draw and paint well! Vivekananda Institute Of Human Excellence is conducting a drawing course for children. This course is for children in the age group of 8 to 15 years, and will include sessions on the basic drawing and painting skills. Fine arts, like drawing and painting, develop creative skills and an aesthetic talent among children. They also improve concentration, which is a very an essential requirement for students. 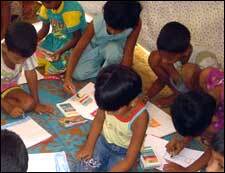 This also helps them in improving their mathematical and scientific abilities, when they move on to higher classes. The admissions for this course are open from 20th May 2005. Be the first to comment on Course On Drawing And Painting For Children! Just use the simple form below. fullhyd.com has 700,000+ monthly visits. Tell Hyderabad what you feel about Course On Drawing And Painting For Children!